I was driving East on Anderson Street. It's the road that connects my house with the Truman Parkway. It's the road I take multiple times every day, and it's the way I take the kids to school as I had just an hour earlier. But on this day, February 12th, also known as Georgia Day/Lincoln's Birthday/Fat Tuesday, I got lit up like a skinny wideout in Ed Reed's airspace. It was about 9:50 AM when I left the house in my karate gear. 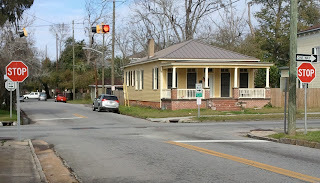 It had rained quite a bit so I wanted to avoid the standing water on Abercorn and take the end-around to the highway. Chuck Todd had gone to commercial so I switched over to The Spectrum, where I caught Kate Earl's One Woman Army - the last song I would ever hear in the Nissan Murano. I was cruising down the thoroughfare when I caught it out of the corner of my eye. At my 3 o'clock, an old tan minivan going at roughly the same speed as I was on a side street. It didn't dawn on me that someone could run the Stop. The photo I took of Paulsen Street was on a clear day, but there are two Stops and a blinking red light. 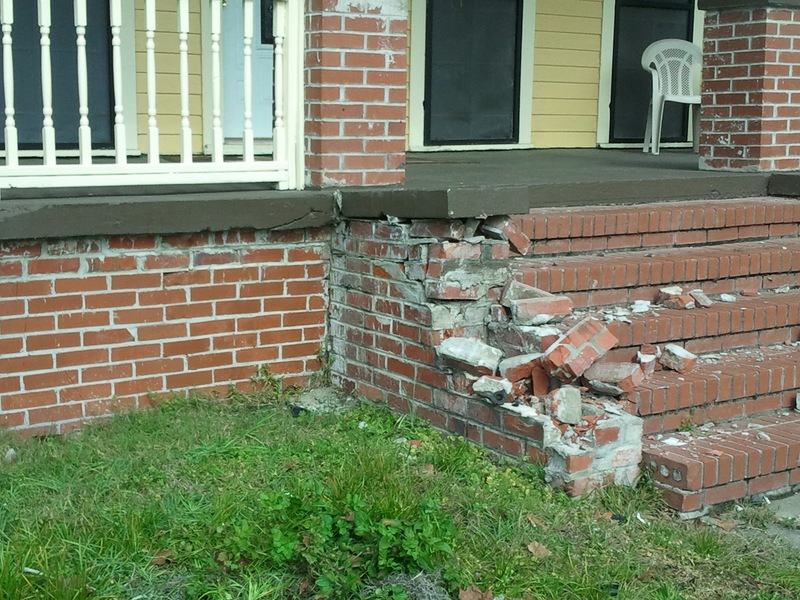 This is the view of Driver #1 (her official name in the police report) aka "not me," who plowed me into the brick front steps of the house pictured here. I didn't have the presence of mind to take a picture of the steps with the passenger's side of my vehicle resting on them. But back to the moment, when I saw the other car it was too late. I couldn't slam on the brakes, I'd spin out on the wet road. So I hoped that it would swerve around me and braced for impact. I became Driver #2, aka "the shlamazel." The moment was cinematic, as I've played it out in slow motion in my head. It was a tooth-jarring collision that sounded like a gunshot. 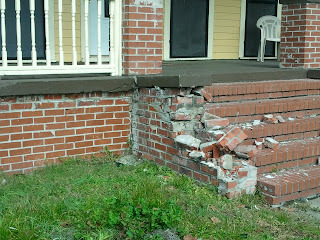 All the airbags activated as the car spun around until it was jerked to a stop by the brick steps. 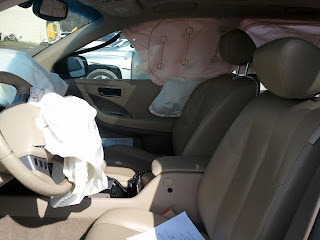 The front of the car was smoky and sulphury from the force of the airbags, the windshield was cracked, and the horn from the other car was blaring. I wobbled out and there were witnesses on the scene within moments. After asking me a number of questions, "Are you OK? Is there anyone else in the car?" the resident of the house brought me a chair from the porch and told me to sit down. 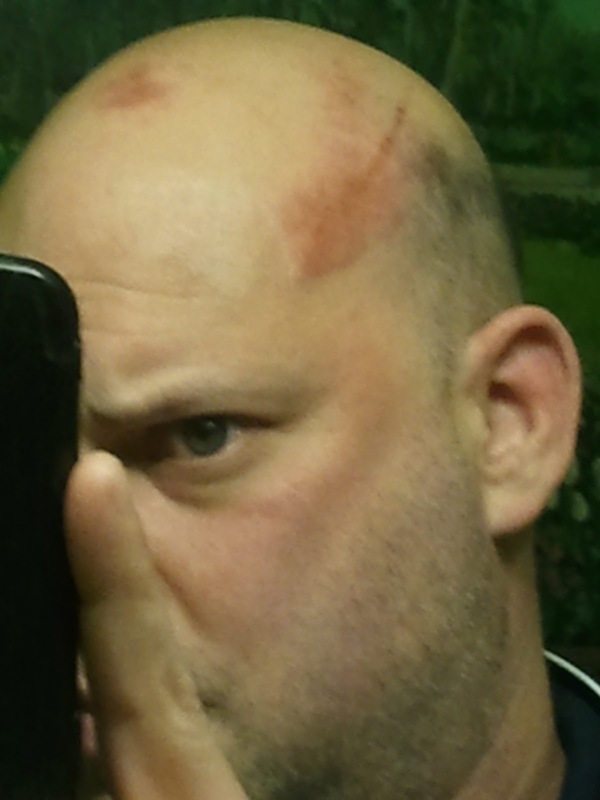 I was told there was a "gash" on my head, which turned out to be just an aggravated rug burn from the airbag. I still looked more like Uncle Fester than Frankenstein ("FrankenFester"). Police and EMS were on the scene very quickly, and I was sitting in my chair generally being left alone. 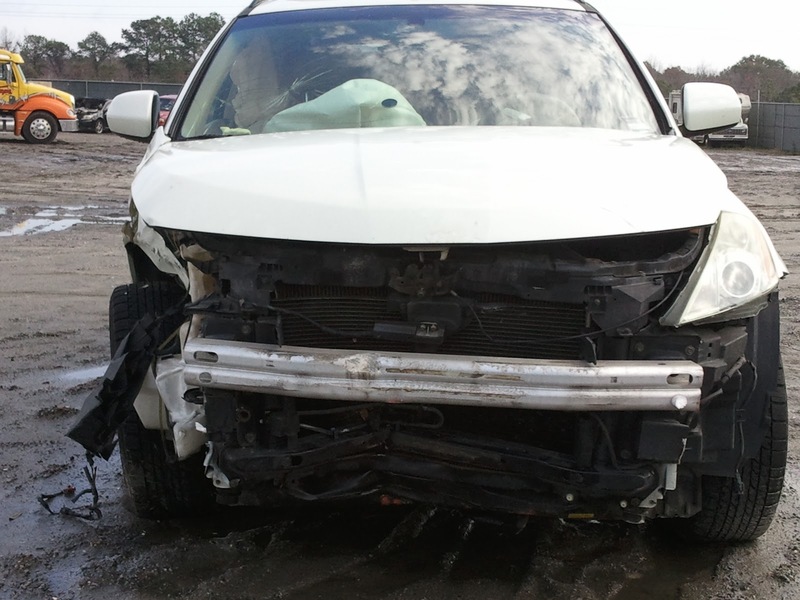 Driver #1 and her passenger were taken off in gurneys and neck braces. The witnesses had told the cops what had happened. The EMS guy asked if I needed medical attention. I didn't know, I was a little jelly-legged going to the car to get my license and insurance, and now I had to decide in my frame of mind whether I needed to go to the hospital. I decided I'd better be safe. 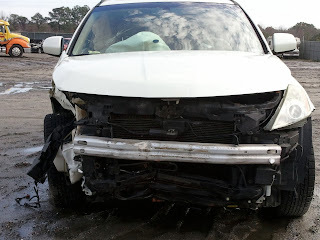 I was only scraped up, but as soon as I complained about some neck stiffness I was strapped on a gurney, immobilized, and was sent off in the second ambulance. The ER is not a place you want to hang out in. Outside of a couple of nice-looking nurses, there's nothing good about the place. There was definitely no urgency to see me though I'm sure I rang up quite a bill. But I was asked my name and birthdate several times to make sure I was still with us. 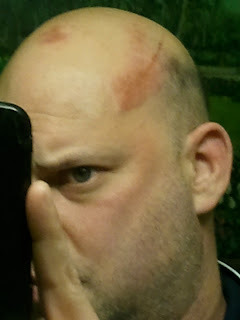 After checking my neck and spine, checking for a concussion, treating the scrapes on my head, assessing my various contusions, and having an x-ray done on my big toe, everything was negative. I was released around 1:30 PM with some very weak pain meds. I was told to be prepared for everything to hurt more tomorrow. I think that's where the expression comes from: "Tomorrow you're gonna feel like you were in a car wreck." Then I obviously had no car, so I had to deal with Geico and then Enterprise. It was time consuming, but got quality service from each. Enterprise really did pick me up, in the pouring rain. I got a GMC Terrain with XM for a month - good enough I guess. I got new car seats for the kids, and picked up some sushi on the way home. After informing some friends and family of my odyssey, I had a pity party for myself with Kentucky/Florida (dud), the State Of The Union (OK), and Justified (outstanding). But it was a nice Fat Tuesday to be alive. Happy accidents are the ones you walk away from.